My university has partnered with Microsoft to offer its students a free version of Microsoft Office 2016 for the duration of their stay. Great, as I was still using the old Office 2011 to read and write the occasional document. This was, of course, unacceptable to me. Sure, storage has become cheaper, but this much of an increase is ludicrous, especially on a small SSD. I decided to investigate. Fortunately, there is an easy solution that requires some tinkering. In the steps below, I trimmed it down to 2.3GB, saving roughly 5GB of storage for other things. In the steps below, we will merge these directories into one shared by all of the programs. NB: if you prefer the command line over Finder: that works, too! It's how I initally did it, too. 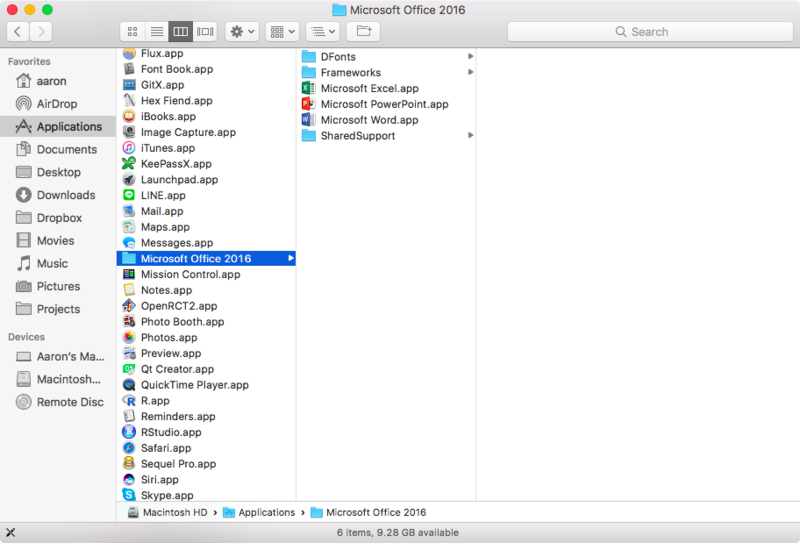 First up, create a new folder in your Applications folder. 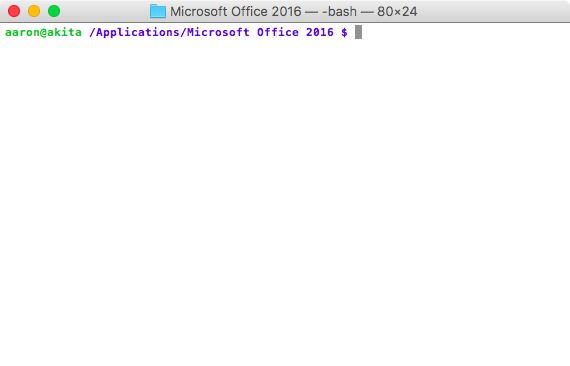 I named it 'Microsoft Office 2016'. Then, move each of the Office programs into it. As we previously mentioned, we're interested in moving three folders out. For each of these folders, select all files and move them to the equivalent shared folder we created in step 2. 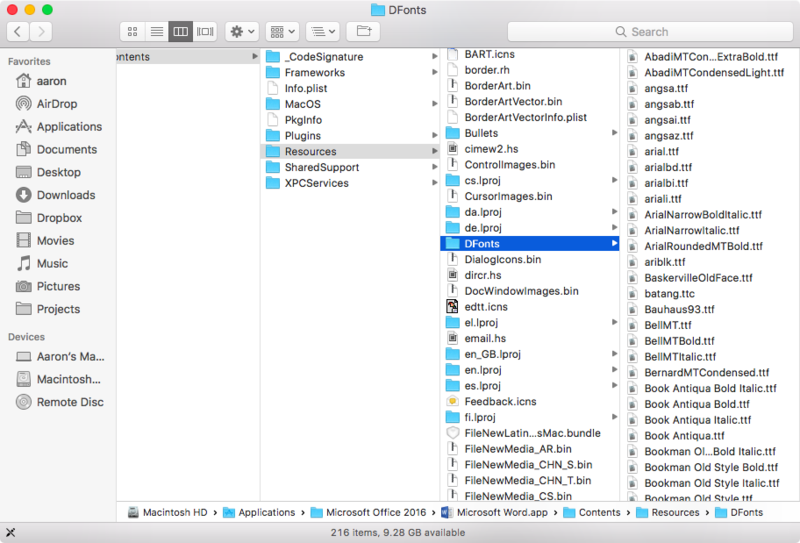 To re-iterate, we're doing this for the folders Frameworks, SharedSupport, Fonts and DFonts — the last two of which are in the folder Resources. If you've installed Office for all users, you will be prompted to authorise yourself as an administrator. Enter your password when asked. You can safely choose to either skip or replace all the files. After you've moved out the files for an application, you should delete the folder from the application's directory. If you chose 'skip' in the previous dialogue, it will not be empty -- that's fine. First, we'll have to open Terminal. It's probably fastest to launch it through Spotlight, but you can also find in the Utilities folder in Applications. Please note: the instructions below assume you have completed each of the previous steps. Please double-check before continuing! Copy each the commands below, pressing [Enter] after to run the command. Now, we'll make the symbolic links for each of the applications present. You will need to enter your password after pressing [Enter]. If no errors show up, you're done! You can now close the terminal. 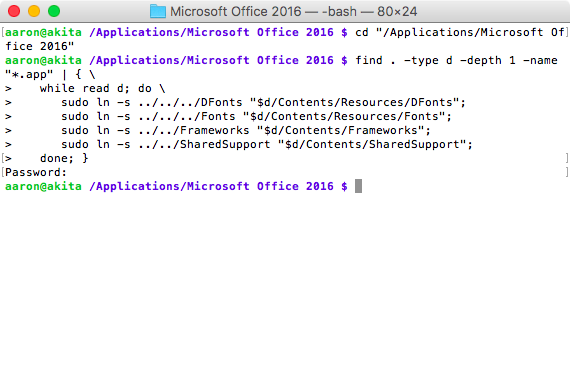 Enjoy your slimmed down version of Office 2016! When Office is updated, the folders appear to be replaced by fresh copies, thereby removing the symlinks. Unfortunately, this means you will have to repeat the aforementioned steps to decrease disk usage once more. As @Jasper suggested, I copied the files between Excel, Outlook, PowerPoint and Word instead of moving them out of the folder. It seems to have freed up about 3GB according to the space available on my disk. 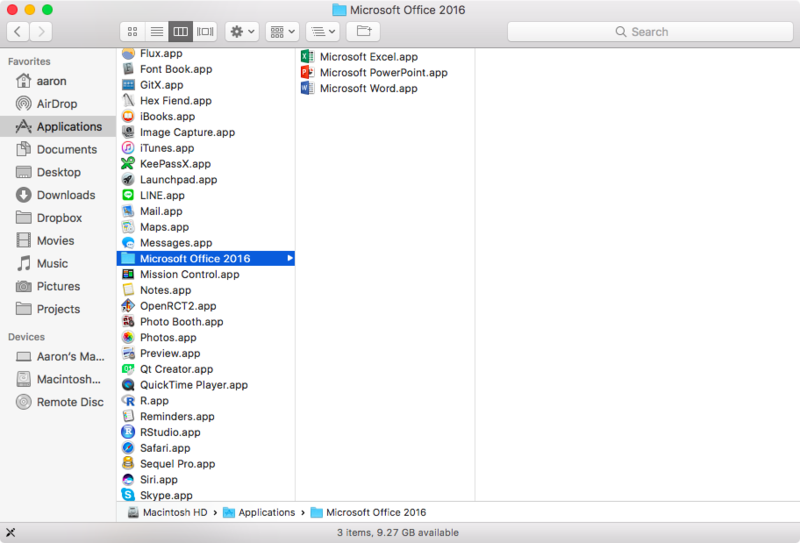 The folder with the four apps says it is still 8,4GB (I'm running Office 365). This would make sense as that does correspond with the contents of the individual apps. I would so love for this to work! - Does this currently work? - Shouldn't there just be 2 (rather than 3) for &quot;Fonts&quot; i.e. &quot;../../Fonts&quot; just like &quot;Frameworks&quot; and &quot;SharedSupport&quot; as it now sits alongside them as is not put into an additional &quot;Resources&quot; folder? I never got prompted for a Password. Neither did I receive an error message. - How does one see and remove a SymLink in Finder? Tried this (version 16.15) and afterward Word would no longer open. pls help me, i don't know how to make hard links to directories, install &amp;quot;brew hardlink-osx&amp;quot;. Hey, this worked great, reduced the total size from around 7 GB to 2.2 GB, thanks a lot! A small note though, in the Office 365 version as of 2018, Excel was the only application with a DFonts folder as far as I could tell, but things seems to be working fine. 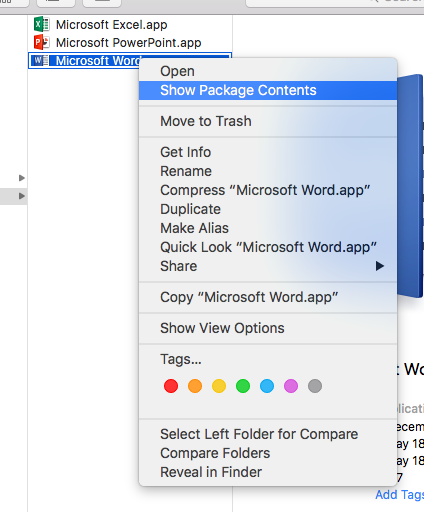 Tried this (version 16.12) and afterwords Word would no longer open. Replacing the symbolic links with hard links, however, and everything is working again. To make hard links to directories, install &quot;brew hardlink-osx&quot;. Well done, great hack, worked like a charm! Tons of space saved. With the advent of APFS and its &quot;Copy-on-write&quot; feature in macOS 10.13 High Sierra, one could simply copy the relevant duplicated files (fonts, frameworks, etc) from one application to all of the others. In theory APFS should now only have one version of each file. Now when there's a software update you don't lose all of the space-saving benefit; only for those files that have changed. My Office was almost 7GB, now it is 2.25GB. Will this also work on the Windows version? Note: the Windows Student version does not ask what you want to install, it just installs everything including Onenote / Outlook etc. Is there a way to undo this? I don't want it anymore and all applications have been acting weird lately. Nice trick! I was wondering also why the footprint is so dramatically big. Thanks for sharing! Tried this on an illegal cracked version from thepiratebay. So after the procedure the crack was gone i was asked to activate the product... :) Just some information... But the very programs worked after it.